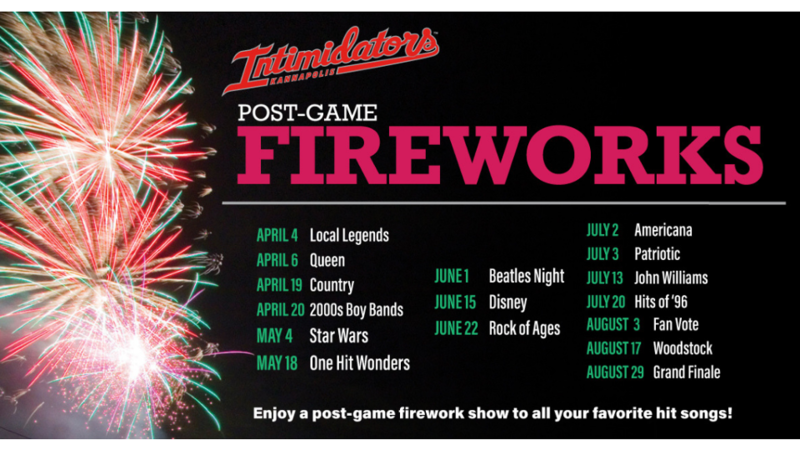 Kannapolis, N.C. - To celebrate the historic final season at Intimidators Stadium supported by Atrium Health, the Kannapolis Intimidators plan to thank their fans with the most action-packed schedule of fireworks shows in team history. As a brand-new element for the 2019 season, each of the 16 fireworks displays will feature a musical soundtrack set to awe-inspiring themes. The Intimidators open the season at home on Thursday, April 4th with a 7:00 p.m. game vs. the Rome Braves, featuring a post-game fireworks extravaganza paying homage to "Local Legends" such as James Taylor, the Avett Brothers and Kannapolis' own, George Clinton. Throughout the season, the Intimidators will light up the sky with a choreographed soundtrack matching specialty themed games. "May the Fourth be with you" when Kannapolis celebrates Star Wars Night with 'Darth Maul' jerseys and fireworks set to the famous movie soundtrack. On Saturday, July 20th, relive the first year of the Boll Weevils and dust off your compact discs with music highlighting memorable "Hits of '96." Enjoy the magic with Disney themes on June 15th or bring the entire family out for Wizards & Wands Night on July 13th, featuring the music of the accomplished film composer, John Williams. Continue the fun and travel through the decades with fireworks playlists from artists such as The Beatles, Queen, and "2000's Boy Bands." Intimidators supporters will also get to pick the songs they want to hear on August 3rd with a "Fans' Choice" display presented in conjunction with the Independent Tribune. The record setting season of fireworks would not be complete without tradition. Celebrate America's Independence Day in Kannapolis with back-to-back extravaganzas on July 2nd & 3rd and commemorate 24 years of history with a "Grand Finale" after the historical final game played at Intimidators Stadium on August 29th. In addition to spectacular fireworks shows, the 70-game home schedule showcases premium giveaways commemorating the 25-year history of professional baseball in Kannapolis, including a six-game return of the Piedmont Boll Weevils. Weekly fan-favorite promotions such as Tuesday Night Bingo, Thirsty Thursday™ ($5 Crafts & $3 Drafts), and Sunday Post-Game Kids Run the Bases return in 2019. In addition, the team debuts Wieners and Wags Wednesdays that, along with three other Bark in the Park games, provides eight opportunities for fans to bring their dogs to the ballpark. Single-game tickets and season memberships are on sale now at the F&M Box Office, online at www.intimidatorsbaseball, or by phone at (704) 932-3267.